Like Mike Johnston writing in The On-Line Photographer, I’m aware that any attempt to line up one or more cameras and show comparison images or make judgements is on to a loser from the start. And any webmaster who puts an external link in the first half dozen words of a new post is losing the plot too! But here, for what it’s worth, is the first line-up of results processed using the same software from A900 and D3X uncompressed raw files converted without sharpening or noise reduction. This was carefully devised to replace a two-dimensional colour checker target with some 3D objects and to provide two different levels of light – the strong backlight and gentle fill-in. 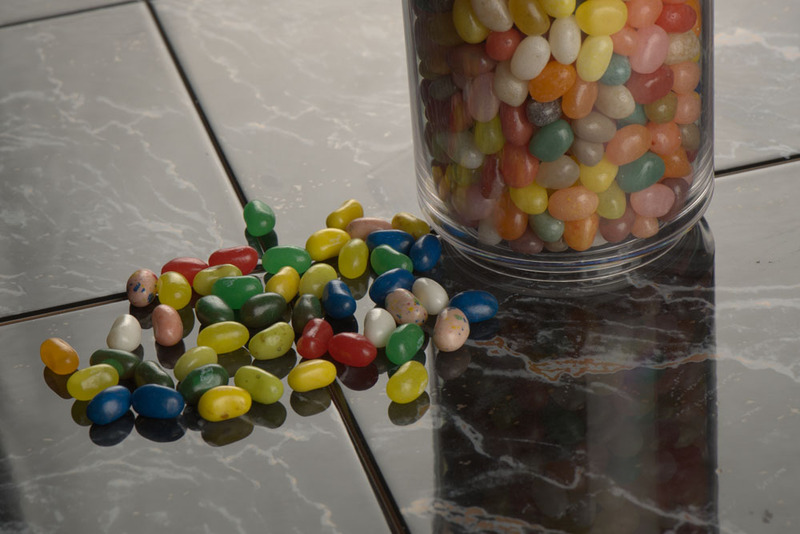 The backlight is strong enough to take the reflection to near whitepoint off the ceramic tiles, but the reflections off the jelly beans provide the real ‘clipping point’ specular highlight. The shadow area is murky enough to show up poor contrast in shadows. However, it’s as close as repeated tests could bring the set-up given the potential for variation between the cameras and the two lenses used (Minolta 100mm f2.8 Macro AF, Nikon 105mm f2.8 AF-S VR Micro Nikkor). You will note that the Nikon histogram shows the warmer balance given by this camera’s Tungsten preset, relative to the neutral given by the A900 Tungsten preset. The lights used were 150W modelling lamps on full power with single scrim softboxes. In most ways this does look a better result – midtones are brighter, the whole picture comes to life. If the Sony is allowed to clip at the highlight end by increasing exposure it is similarly enhanced in the midtones. But the object here is not to create the best still life shot, it’s to show some conditions where tone curves and noise levels can be compared. I used Iridient RAW Developer 1.8.1 for Mac OSX, because this software would process both the raw filetypes and also happens to produce a very fine but distinct noise pattern, based on the dcraw conversion from Dave Coffin. In this respect it resembles Bibble rather than Adobe Camera Raw. Iridient assigns completely different blackpoints and tone curves to the two cameras. These curves are a good match for the Standard in-camera JPEG. The Alpha 900 seems to have much darker midtones despite having a tone curve which does much more to lift these midtones, indicating that the Bayer raw file is written with a much flatter (more linear) A-to-D transfer function applied in the camera. Nikon’s raw file, if RAW Developer’s deep capture tuning controls are to be believed, has brightness value much closer to a processed deBayered RGB image. Since completing the test on December 18th, Iridient has (December 18th later on!) released 1.8.2 which greatly brightens the Nikon tone curve, lifting it even further than the Sony Alpha 900 originally was, and flattens the upper midtone end of the Sony Alpha curve while dropping the shadow low bit values right down. The result is almost a clear f-stop of apparent speed gain for the Nikon and a histogram which no longer even resembles the Alpha. The 1.8.1 conversions were fairly matched, the new conversions are not. At this stage I am not replacing the files with new versions. I will leave further investigation of that key difference to experts. Let’s just say that attempting to further lift the Sony tone curve to match the Nikon ‘mean tone value’ increases the noise levels. Since the Nikon is clearly already holding a clear advantage in noise levels this is no help to the Sony. What this shows (I think) is that the Nikon image is using more of the available bits (RAW Developer uses a 0-255 scale for adjusting black and white input points, but of course the source files are 12-bit for Sony and 14-bit for Nikon). Less tonal transformation has to be done by the raw processing software, and less noise will be added in the process. Comments from raw file experts are welcome, especially an explanation of why most raw file formats do not use the low values at all but Nikon does. Disclaimer: Iridient continues to refine default camera processes for each file-type. My processing using this software happened at a very early stage (this release for example won’t handle Canon EOS 5D MkII files, so it was surprising to find the D3X supported with good looking results). Since RAW Developer allows full control over the raw conversion input, camera profiling and related functions the defaults used are one possibility out of thousands. In-camera JPEGs do look better, and so do adjusted raw conversions. My intention here has been to remove adjustments and show as ‘flat’ a matched result as possible, without the extreme of showing the raw files as they appear above. 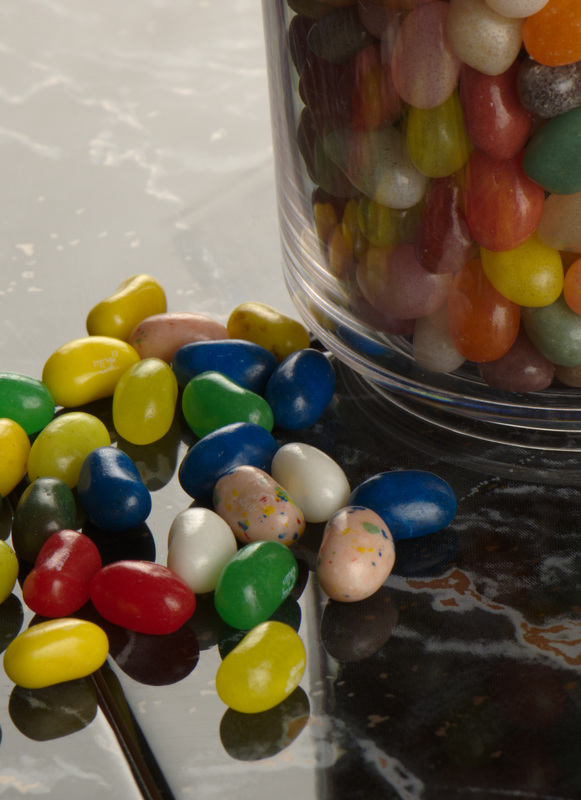 For each ISO setting, I have clipped a 5 megapixel area out of the image, with the focus point set on the pink jelly bean between the two white beans. Do not try to judge sharpness from this test, that was not the purpose and capture sharpening has been disabled (so has capture NR). You can also go to the first image pBase directly and then click NEXT to view each subsequent image. Please remember – if you see small variations in density, that is a result of how the ISO setting and the identically controlled exposure (Aperture priority auto, matrix metering, viewfinder eyepiece closed, 2 second self timer) interacted. The test is not made invalid by density variations; these are additional information about how the camera performed. If they were to be corrected in processing, that would invalidate the comparison. Remember, no WB adjustment has been made in processing. This is a result of the Nikon Tungsten preset compared to the Sony Tungsten preset, and the JPEGs show the same difference. And, again, you can go to the first image on pBase and click NEXT to move through the series. A very good way to compare these images is to download them all and open them in Photoshop CS4 as a set of tabbed files in one window, to the same size 100 per cent view and absolute position. Click each tab in turn and you will see the precise changes in noise, colour and density almost like an animation. It is not possible to line the Sony images up with Nikon, because the differences in the 100mm and 105mm lenses and the camera body depth required a tripod height and distance change. The purpose of this article is not to trash the Alpha 900’s performance, though some will see it that way and insist that some alternative processing method would work miracles with the 900. There is some truth in that; the A900 files may work better with a completely different de-Bayer strategy, and so for that matter may the Nikon files. I know that both cameras are usable to their maximum ISO with excellent results in appropriate conditions. The purpose of the article is to shown how they are placed on the starting-grid before any raw conversion or post processing is applied. It obvious that Nikon’s internal processing strategy pays dividends and that £5,500 does buy a superior ‘image-sensor plus onboard processing’ performance, compared to £2,000 (make those £4,800 and £1,600 at current street prices, time of writing!). The obvious question to Sony must be – why can’t you manage the same, or at least come a little closer? They might reply that an extra half stop or stop in dynamic range, with its highlight and shadow recovery potential, matters more than the finesse of grainlike noise patterns. And they might be right. Until we have D3X raw file processing with a number of utilities including Adobe Camera Raw (the champion for dynamic range recovery, and the worst for mushing this fine crisp noise into something far coarser and softer) we’ll have to wait and see. I can just tell you I’m happy with my Alpha 900 and even if I had the money to spare, I would not swap the smaller lighter body, better viewfinder, inbuilt SSS stabilization and slicker interface for the D3X. D700X in future? Maybe, but even then the SSS with the wide range of lenses I use could be the deal-breaker. Your own choice may be different, and if you are reading this as a Nikon owner, I hope an Alpha 900 sized and priced body does appear in due course for you with this same excellent 24 megapixel performance. IDC will not even recognise any raw file as one it can open, except .ARW. In case you knew something I did not, I changed the extension on an .NEF file to .ARW but IDC just identified it as a corrupt file. No chance there! Dave, have you try to open the D3x RAW with Sony IDC3?? I have done some tests on the D3X using 12-bit and 14-bit, and there is absolutely no difference the eye can see on this subject (or a similar one, rather, same tiles and setup but different items). I used non-compressed, full size raw. If the Nikon gains anything from 14-bit, it’s definitely not at the shadow end and it does not affect the noise profile much (there is a slight difference in distribution of noise, but no visual improvement). Also, as far as I have been able to tell from many shots (not tests, just shooting) the Alpha 900 captures more recoverable shadow detail and highlight detail, with its 12-bit conversion, than the Nikon does with 14-bit – at least with any currently available raw converter. I guess this is due to gain inside the camera, which also produces the higher native ISO, which also produces the higher noise. So you are right in one sense, an underexposed Alpha 900 ISO 100 raw corrected in raw conversion will probably produce about the same range as a correctly exposed Nikon ISO 100 raw. You would be applying the gain curve outside the camera not inside it. The test target seen is as I have read others say , very well thought out , for shure the best I have ever seen . I Believe these tests have uncovered the reasons for the mistaken Nikon advantage in High ISO noise . ( Evidently the difference in the way these two Cameras meter the seen in each ISO setting ). But I am not sure this is exactly how it works . My question for you , is why not underexpose the ISO 100 shot with the Sony , to get the Highlight detail back in range . Probably a stupid question because it would’nt be a ISO 100 shot if you did that . Of course you could shoot in Manual and set the shutter to 1/2 the time . or use the EXP compensation in Auto Exposure . Either way the picture would probably be the same as the ISO 200 result . I am close to taking the A-900 , I just wonder how the 12 bit effects the seperation of fine density differences compared to the 14 bit of the Nikon . I have seen from my own a-100 some photos have density bands or layers across the sky in some shots . I have not checked to see if they were developed with 8 bit output or what went wrong . The best comparitive article that I have seen. Thank you. The scene is intelligently and amazingly well thought out and shows very minor differences clearly. This is far better than any graphed testing. What I see here are several things. Firstly the overall noise differences show about 1 stop advantage to the Nikon at high iso only. I compared the photos with a one stop offset so that I looked at the Sony at, for example, 1600 and the Nikon at 3200. The noise at that 1 stop difference is not identical but overall it is the same. For instance, at that one stop differential in iso, the noise in the blue and green channel is better in the Alpha while, the noise in the Red is better for the Nikon. So overall those individual differences equalize out but at a one stop advantage going to the Nikon at high iso. If that is as a result of getting better dynamic range for the Sony than I feel there is no advantage to the Nikon processing as there are other offsetting gains that make up picture quality. But that is not like the overpowering three stop advantage for the lower resolution Nikon D700 in Comparison to the Sony a900. I can live with a one stop difference at high iso – especially since that difference is equalized by in camera antishake. Secondly, there is trouble with the Nikon 100 macro. 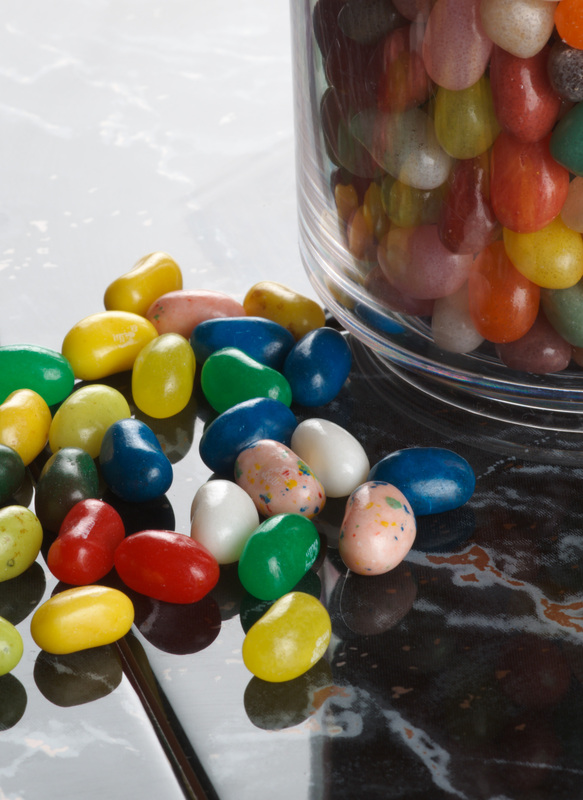 Look at both photos in iso 200 set (at full size) and move the photo about 1 jelly bean to the left of the middle pink bean, where there is a clear area with a light gray background. Then look for color fringing at the light to dark borders. The Nikon lens seems to have some trouble with a lot of color fringing in comparison to the Minolta. That characteristic is maintained thru all iso comparisons. Thirdly when looking at the iso 200 photos for each system the Sony has a lot more fine detail and sharpness – in the pink jelly bean for example. But there are other areas where the Minolta image looks a lot sharper as well at isos from 200 to 800. 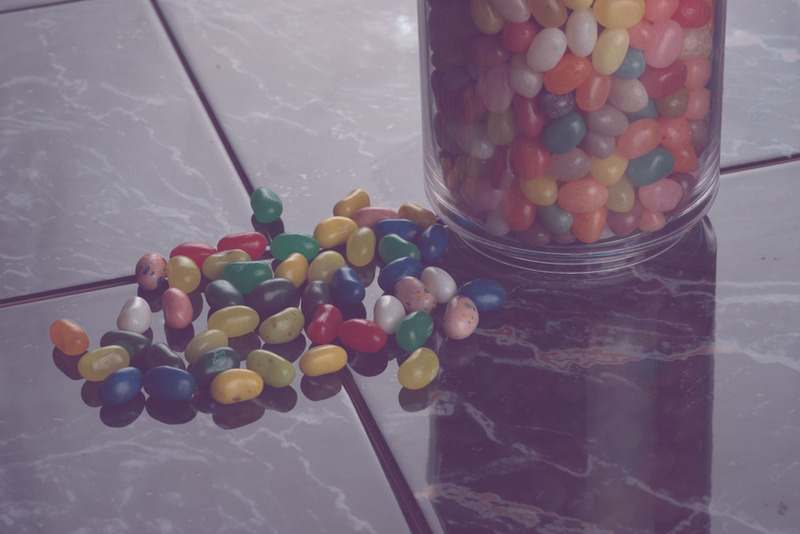 I thought this might be from focusing differences and so looked at the plane of focus and saw that they are identical and transect the pink jelly bean at the same point. Perhaps that loss of detail and sharpness for the Nikon image might be related to the color fringing in the Nikon Macro. Ordinarily, I would expect some CA in the border areas but not so far into the central are of the frame. In looking on the internet the Nikon 100mm macro is not rated well and far below the Minolta. At //old.photodo.com/nav/prodindex.html the Nikon gets a 3.9 out of a possible 5 and the Minolta gets 4.5 out of five. But many other lens rating sites show this as well. So the sharpness differences seen in the two sensors with the Sony way ahead might be because of the lower quality of the 105mm F2.8 Nikon Macro. Which brings me back to the unbiased reality of this test. I believe the conclusion is that the Nikon has one stop less noise and the Sony better dynamic range. Those differences cancel out for me so I will save 5,000 US and go with the Sony. The difference in price will allow me to lease a Lexus for more than a year or feed my family for a year. One other point is that no one makes a compact F1.4 50mm lens with antishake. If there is a two light stop advantage to the Sony in-body antishake function that puts the Sony ahead of the one stop advantage to the Nikon. Overall for night street photography, available darkness photos, or in home photos with available light the Sony with the 50mm 1.4 is far better and a lot cheaper. In addition, imagine walking around with the Nikon Behemoth and newly designed bulky large and heavy Nikon F1.4. That combination literally has dimensions of a soccer ball and weighs in the area of 4 lb (or about twice the weight of the svelte Sony with Minolta/Sony 50mm 1.4). In any event, thanks so much for your time and effort. I was hesitant about the noise issue but now that all is in the open and clearly seen in your photos, I feel the a900 will soon find a home here at my place. Yes. For the same situation, the two metering systems suggested very different settings. 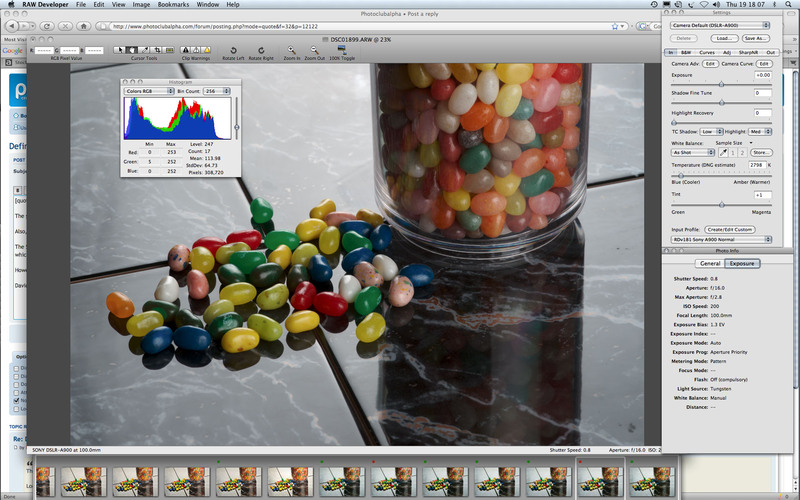 If unmodified auto exposure was used, the Dynax result was 1.3 stops underexposed. Simple as that – I used Aperture Priority on both cameras with the viewfinder blinds closed. To get the exposures equivalent, the two cameras actually needed slightly different real exposures anyway – to get these to match in final image density, the Sony needed this correction. However, it is mainly to do with how the metering reacted to the scene, not with sensor sensitivity. Re the Nikon, generally: it has a sensor/processing set up which, for a typical midtone 128 value, works out about 2/3rds of a stop higher in true ISO than the Alpha. On top of this, the Nikon metering in most situations is more generous, and often produces overexposure (the Alpha hardly ever overexposes any scene). In working situations, the Nikon can be as much as 1.5 stops brighter than the Sony for a given view in front of the camera. As to which is preferable, I’m not sure. You just have know the cameras. But in noise tests it works against Sony. Hi David, thanks for sharing this interesting test. Checking the images exif I saw a huge exposure bias +1,3 EV for the A900: did you notice it? Is there a technical reason? I will check the website looking for the answer. It’s all about the green jelly, by my eye — have a look at the green jellies at 1600, 3200. The green beans in the D3X shots suffer serious luma noise (i.e. worse than the 900), quite noticeable on a bright LCD, maybe less so on a calibrated CRT or in a print. Still, I think the A900 shot at ISO 1600 would be the more usable printed large, given how strong the luma noise is in the green jellies on the D3X. I don’t know much about this stuff, but is there a chance the Nikon noise processing (moving the black point or whatever) is also degrading the green channel? This may be another benefit to Sony’s more “linear” approach to RAW output. And, I’ve read (on Luminous Landscape was it?) that it is better to have more linear output from the beginning, since the various printers out there will make a better print from an image that stayed close to linear all along the workflow. At 3200 and 6400 the chroma noise from the A900 gets to be unbearable, but up to 3200 at least you could still get a nice B&W conversion out of the image. I wouldn’t print the ISO 1600 very large, but maybe up to 8×10 in color. There is a huge leap in chroma noise in the A900 files, from ISO 800 to ISO 1600. OTOH, coming from an A100 I can say it isn’t all that bad, just quite a surprising uptick in noise given how clean ISO 800 is. One wonders (as one always does, out of sheer hope/desperation) about the possibility of a firmware improvement. The A100 saw a fair improvement in high ISO noise from firmware v1.04, which as far as I can tell simply forced the camera to ETTR a bit more than it normally would. Thanks for putting together this comparison, David! “Much as I wished to acquire an A900 before 2009, the noise issue kept me from doing so and I feel a little let down. I’ve been asking the exact same question about SONY; why not go for the best noise management when being the actual brand that provides other brands with their most advanced technologies? Why the preference to stay behind and watch other brands enjoy Sony’s delicate and precision-intact advancement in electronics? Have you seen the Romance of the 3 kingdoms? Maybe Sony didn’t want Nikon to fall behind too far so Canon can run away before Sony has a chance to rebuild the Minolta SLR empire? I looked at the A900 and D3x ISO 6400 files. Although the D3x looks a bit better it is surprising to me how good the A900 looks. Darn, ISO 6400 and 24mp! Maybe I am not as jaded as some people are. I also tried a big of Neat Image on it with luminance reduction set to 0 and it looks even better. Yeah, the D3x is still a bit better with a bit more detail, but the A900 is amazing, I think. David, I was just wondering, if you take the A900 file and use noise reduction software in post-processing do you get results that are much better and look more like the D3x? The discussion gets into Nikon clipped back levels (clipping some noise as well) and of course speaks a bit on NR schemes. Nikon and Sony both use raw NR and the Nikon is a bit more sensitive overall, but quite possibly one the biggest contributers to the low noise output is the Nikon clipped blacks. Silkypix last early preview version (3.0.27.1EP) supports both cameras and I think it would make a better job here. Thank you for the review David. Much as I wished to acquire an A900 before 2009, the noise issue kept me from doing so and I feel a little let down. I’ve been asking the exact same question about SONY; why not go for the best noise management when being the actual brand that provides other brands with their most advanced technologies? Why the preference to stay behind and watch other brands enjoy Sony’s delicate and precision-intact advancement in electronics? I’m hoping for some good news addressing these issues from Sony. Soon I hope..
Is possible that Nikon is processing RAW and eliminate the chroma-noise or the RAW software editor do that?? It is the old version of the Minolta – 1986 I would guess. It has always been an excellent lens and no real need to upgrade to a later one. I have been doing more experiments by creating a new tone curve midway between the ‘new Nikon’ and ‘old Sony’ used by RAW Developer, and it not possible to make the noise levels look the same at 6400 though I can get better results from both cameras with some customization of black points, curves etc. But before any more work, I intend to wait for more raw developing choices to arrive. Very good comparison, I like the scene very much. It would be interesting to get a full review of what difference raw converters do would be interesting, but that’s a whole different review; and really can’t be done yet anyway, as support isn’t really out yet. I don’t know about anyone else, but at low ISO, I see only very moderate differences between the 2 cameras, and at that, neither really is better. At high ISO, there is a fairly stark difference — I would like to say that it was down to in camera noise removal, and that the same results would be found from each after thorough post, but I don’t think so, there is notable more detail in d3x images. However these cameras (despite the very similar spec, and the 3xish price difference) are aimed at the same market, mainly the studio/landscape where very few people would be using high ISO, in that respect all is well with the Sony. It’s not like it has bad high iso performance, set it to 800 and it will take perfectly usable pictures. As for the lenses (which is the only other variable)– they are about as closely matched as they could be, I know that the Minolta 100 is about as sharp as they come, I can only assume the Nikon is similar, after all it’s a well understood length, and it’s not really that challenging to make. Out of interest, which version of the 100 are you using, I have the RS D version?